A varmint’s worst nightmare in the form of a silent, but deadly projectile that offers flat shooting trajectories, potent energy delivery on target and a devastating polymer tipped projectile in a mainstream firearm platform caliber. Now more than ever, shooters can enjoy varmint hunting with the equipment they already have. 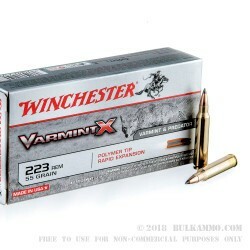 Winchester’s Varmint-X 223 ammo has made sure of that by producing a specific varmint load out of a known, proven base line of cartridges in a caliber that more gun owners have access to than nearly any other caliber. 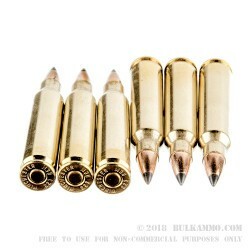 The 55 grain projectile is a versatile bullet with potential for use in just about any barrel twist rate and offers significant advantage for the smallest game compared to other larger, heavier projectiles. The blazing fast 3240 fps velocity and the 1282 ft. lbs. 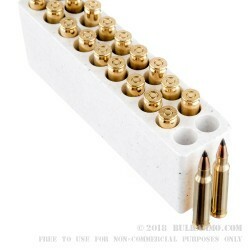 of energy that it makes at the muzzle proves this is enough for the most stubborn varmint available. 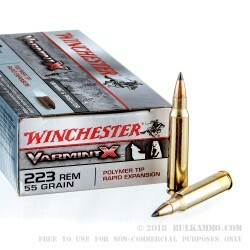 The added bonus of being able to effectively control predatory animals with this round makes it a versatile choice when you need premium accuracy, excellent ballistics and proven reliability in the .223 Remington.